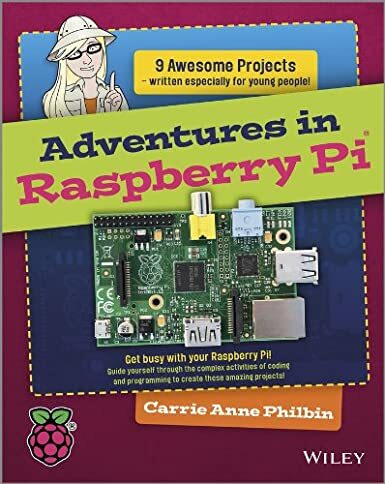 “Adventures in Raspberry Pi” is a book by Carrie Anne Philbin, a valued member of the Raspberry Pi community. Miss Philbin is a secondary school teacher of computing so knows a thing or two about the challenges of teaching kids computer programming. Her book aims to teach computer programming and some system administration skills to kids using the Pi. No previous knowledge is assumed so is suitable for everyone. The book is written with 11-15 year olds in mind but I suspect it will be useful for a younger audience with appropriate support. The book takes the reader through 9 sections filled with tutorials and projects. Where possible the child can follow the instructions themselves. What makes this book slightly different from your average Pi publication is that it is supported by a set of videos which help inject additional fun into the exercises. This is a welcome addition as it helps keep children engaged while also supporting the adults who may be using the material as a teaching resource. How can I be so positive about a book I’ve not even seen? Simply because I’ve followed Miss Philbin’s Raspberry Pi journey and she has real experience of delivering this sort of material to real kids. The title isn’t an exercise in marketing. It is a backed-up on real-world activities with lots of lessons learnt along the way. This is the perfect gift my Alchemist science club members. I am looking forward to use this great resources. We are jamming away on the Rasp Pi. The kids are working on Scratch and Python as we speak. I can’t wait to share this great resources with the science club members. Is there any indication of what the ‘9 Awesome Projects’ are?